Here is the final painting/illustration entitled "American Heritage." 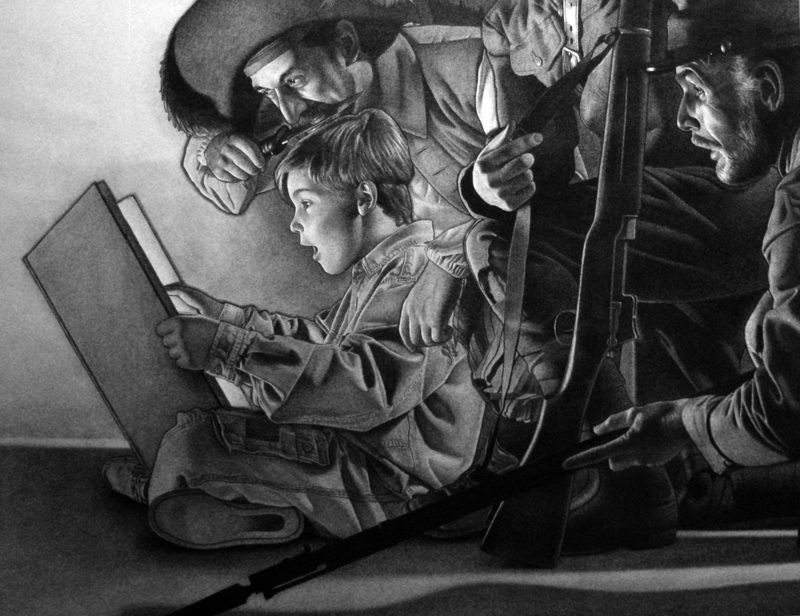 As I stated in my previous post, this was my official 2013 entry for Artprize ( http://www.artprize.org/jason-dowd/2013/american-heritage ). Limited edition prints of this painting are available. These giclee prints of "American Heritage" are pencil signed by the artist/myself and are offered printed on paper or canvas. Currently, an 18" x 18" paper or canvas image (edition of 250) is $395.00 (unframed). A 27" x 27" (original painting's size) paper or canvas size (edition of 250) is $575.00 (unframed). Please contact me at jason@jasondowd.com if you wish to place an order. This piece took approximately two and a half months to complete. The first step, after initial thumbnail sketches, was to proceed to finding models, costumes, and getting photo reference. Per my previous post description, I mostly used friends to pose as models. They were all happy to oblige and I knew it was going to be be an exciting experience. Next, I needed just the right costumes. As I had been using models for illustrating book covers already, a local (and extraordinary) costume shop, Robert Schmidt Costumes ( http://www.robertschmidtcostumes.com/ ) had everything I needed. Their assortment of choices was staggering as the warehouse is some 15,000 square feet! It was fun sifting through the all of the possibilities, even finding some clothes dating back to the 1880's. After a few hours, all theatrical attire had been found and it was time to move onto the stage. Since this is a multi-figural composition with complex lighting, special attention was needed for the arrangement of characters. At that time, before digital photography, I did not trust my skills as a photographer, so again I took my cue from Mr. Rockwell and hired a professional. His studio accommodated all of our needs for space, lighting, and special equipment. We experimented with groups shots, warm/cool gels, and expressions, finally realizing that we would need to photograph everyone individually. Now that each character's position had been established within the composition, we focused on photographing as much detail as possible. It would be my job later to assemble their images into a cohesive picture. I thanked all of my models for their contribution and it was off to work! The preliminary drawing (see Figure Drawings, September 12, 2013 post) solved all issues concerning drawing, value, and detail. It was a lot of work, which paid off in the end. I was determined to follow Rockwell's procedure and he expressed the importance of this step in his book "Rockwell on Rockwell - How I Make a Picture by Norman Rockwell" (Watson-Guptill Publications, New York, in cooperation with Famous Artists School, Westport, Connecticut, ISBN 0-8320-2380-X). I highly recommend this book as a resource for anyone interested in picture making. Its principles have not changed, and if dutifully followed, can yield artistically fulfilling results. 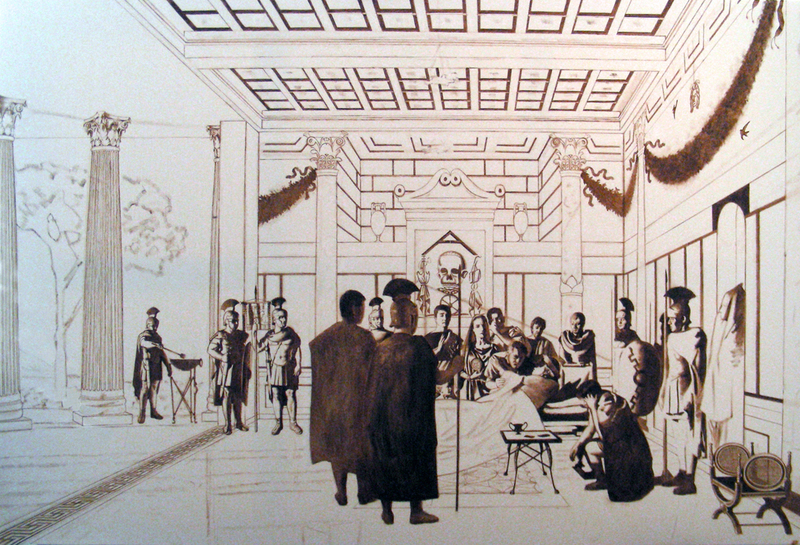 The final painting began with a contour/line drawing onto double thick cold-press illustration board. I gessoed this board, keeping areas with face and hand details smooth, while modeling/texturing others for visual interest. This next part was my own creation, having experimented with other works and achieving desired effects - I freely applied pure (out of the tube) acrylic paints to the background. It looked like a circus at this point, but I knew where it was going. 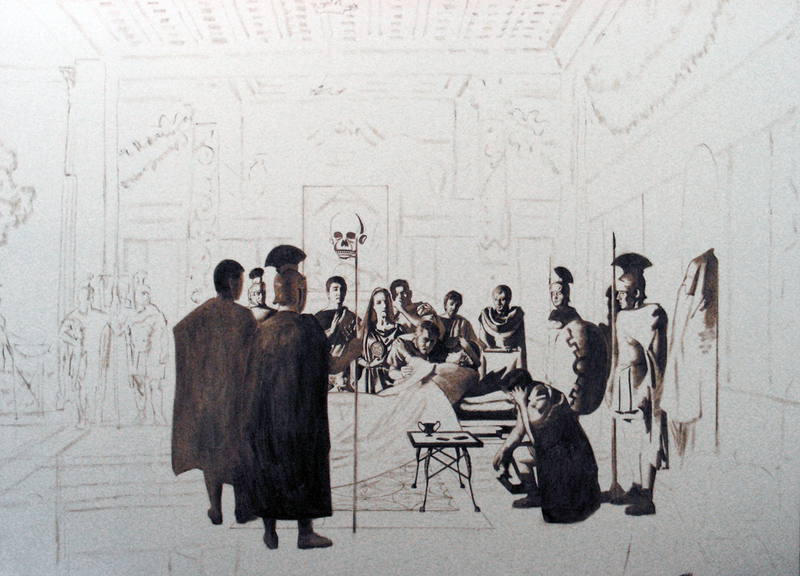 Once dry, the whole surface was sealed with workable fixative. My favorite oil color of the time was Brown Madder Alizarin and it was going to be the unifying layer of all these presently gaudy acrylic colors. A thin glaze of BMA was all that was needed to create a jewel-like glow for the shadowy air of the background. This would serve as a nice contrast to the light emitting from the book. As this paint dried rather quickly, it was necessary to work in sections (background first, faces next, then figures. etc.). Building the layers of paint, known as Indirect Painting, allowed for moderate impasto touches (it is a relatively thinly painted work), and many glazes of transparent colors. Small brushes, attention to light on form (chiaroscuro), and much patience then allowed for a proud finish. After its completion, it was published as a promotional piece in American Showcase. Thankfully, it generated much interest and brought in many illustration jobs over the course of my ten year illustration career. Thank you Mr. Rockwell, Mr. Leyendecker, and so many other wonderful illustrators that inspired this work! This drawing was created in order to fully develop a concept I had to inspire children to read. It also served as an homage to Norman Rockwell and J.C. Leyendecker, as it was they (and my father Ken Dowd), who inspired my desire to become an illustrator. It is a 30" x 30" charcoal on buff paper. Here is a detail of the drawing. It was a real treat to follow Rockwell's process, using friends and even strangers to pose for the characters. The fellow, for example, posing as the WWl dough boy maintained our studio copier. He walked in one day and had just the right look for an American youth of that period. He resonated a sense of fragile innocence, adding depth to his role in the picture. Others seen are Trey Willis (boy), Richard Bernal (pirate), Lee Brubaker (civil war soldier), Clair Bellows (gangster), Tom Casey (pilgrim), and Paul Chilton (mountain man). Mainly, I worked from reference photos (something Mr. Leyendecker would have scoffed at), but it was the most efficient method in capturing the details of costumes, nuances of light, etc. Also, the expressions of each individual had to be captured, contributing to the overall sense of wonder. Many decisions were made in regard to these aspects of storytelling. Familiar personalities communicating universal ideas is what I have learned most from Norman Rockwell and Joseph Leyendecker. 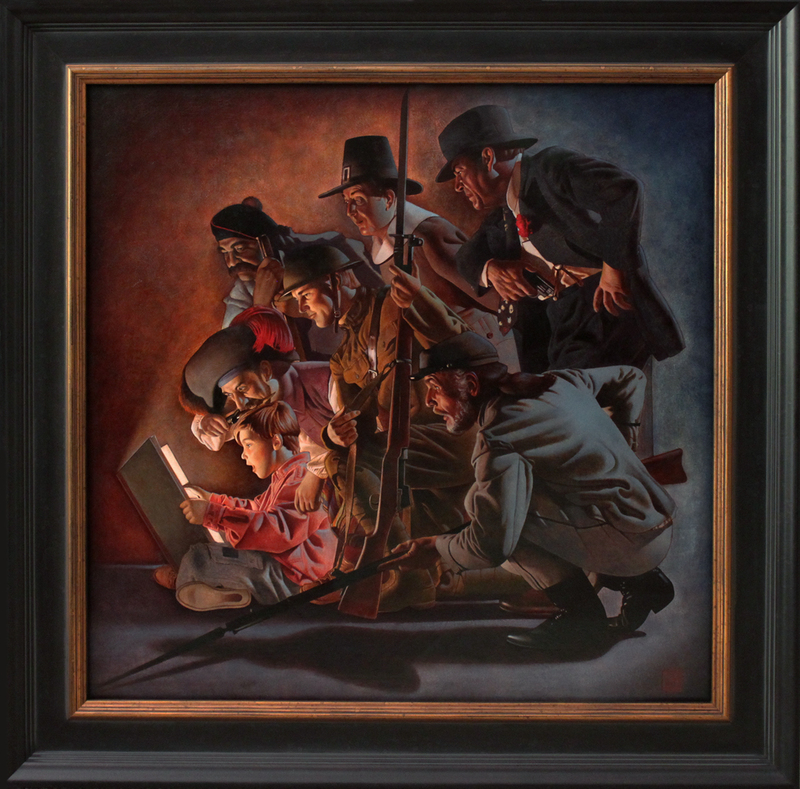 In my next post, I will be showing the final, framed painting of "American Heritage" as my official 2013 entry for Artprize. My illustration career lasted the decade spanning 1990-2000. With the advent of the computer, it was time to decide whether to go digital or stay traditional. Though I have come to embrace the digital age, I, like many artists, was weary of it when it first came on the scene. The traditional path held my fascination and I turned my sights on fine art. Here we see a figure drawing done in charcoal (8" x 10"), demonstrating the process I use to finish an informal work. First, I lay in the contour (freehand), making sure all of the proportions and shapes create the desired effects. Stretching the figure a bit can add elegance to the pose. In this case, the head is slightly smaller and the legs are lengthened, giving a statuesque appearance. After sealing the initial layer with workable fixative (two light coats), a thin dry "wash" of charcoal dust is applied with a chamois. The surface has a Bristol, or smooth finish. Next, a kneaded eraser is used to pull out the lights and mid-tone values. This is a widely used, time-honored technique among artists. 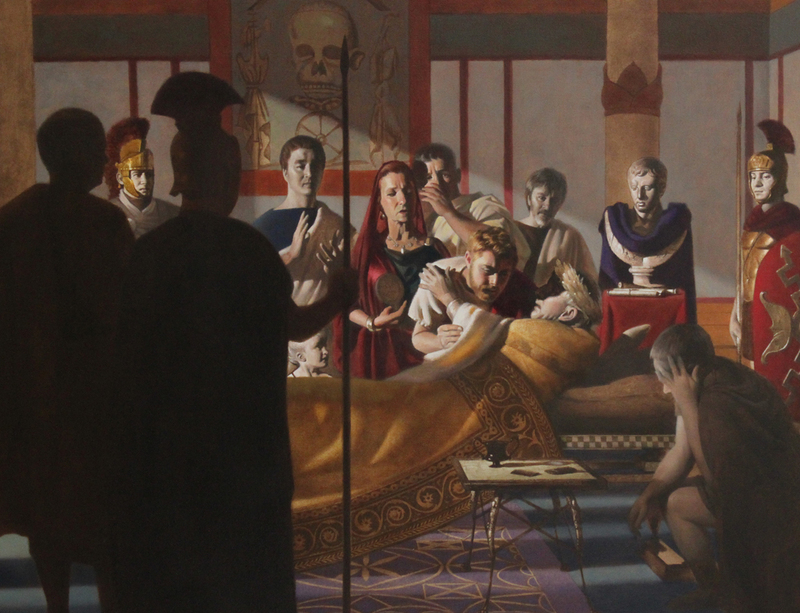 I am going to use my painting The Comedy of Life, the Death of Caesar Augustus to discuss the source of inspiration and the processes involved in creating a complex historical work. This piece took about four years to complete and I now have a much better understanding of what artists of the past had to go through to solve such issues. 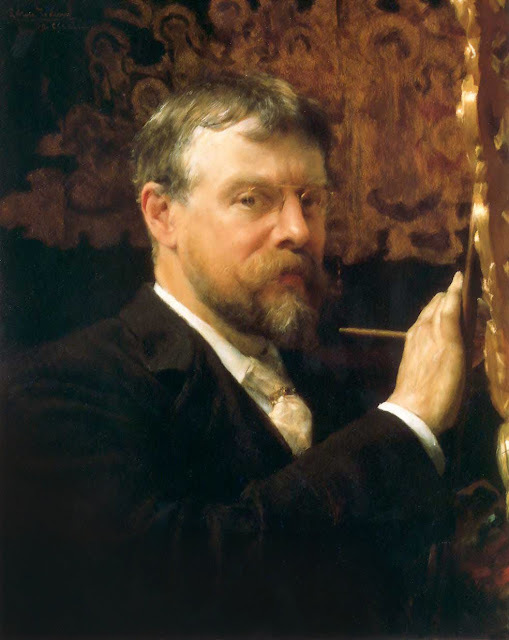 My first source of inspiration was the well known historical painter, Sir Lawrence Alma-Tadema. 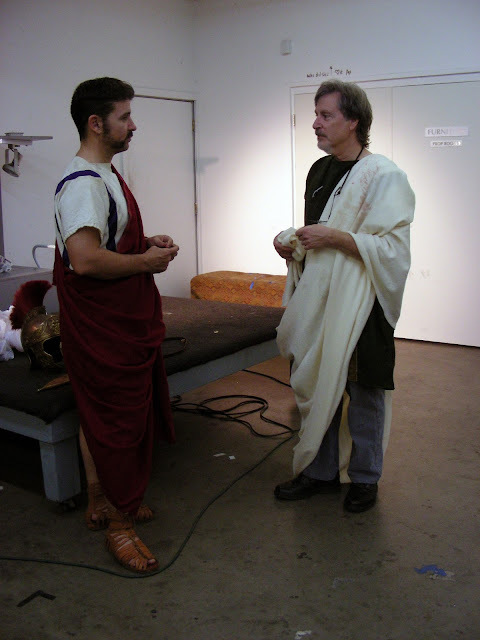 His excellent skills combined with a love of Ancient Rome spoke to me. His passion and attention to detail made me want to learn more about the subject he portrayed. 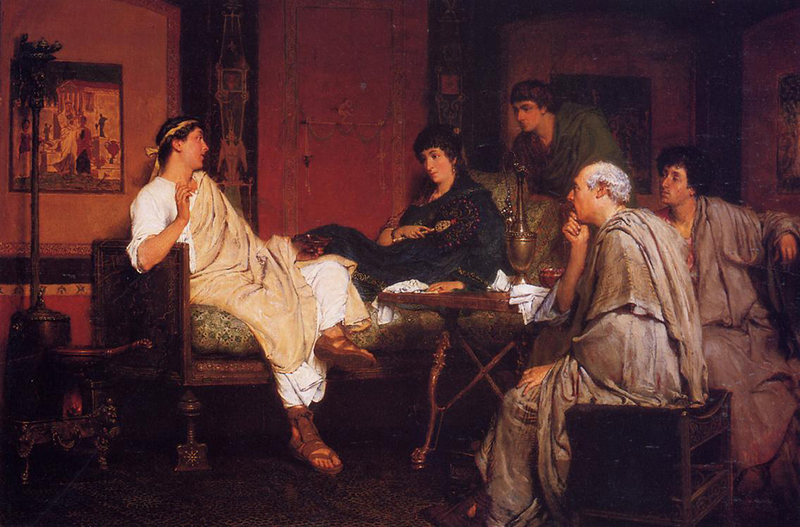 This is one of Tadema’s paintings (Tibullus at Delia’s) that I photographed last summer at the Boston Museum of Fine arts. Again, as you can see, his flair for creating believable scenes with impressive architectural elements, characters draped in proper attire, lively expressions, and all are completed with a soft, yet dramatic sense of light. We know as artists, even a relatively simple setting such as this one, is difficult to portray so convincingly. After researching my subject and imagining what the picture should look like, it was time to contact models, or in this case, reenactors. As luck would have it, an LCAD student at the time knew of many such groups and introduced me to Gil Whitley and Linda Satorius (Gil is seen at left). 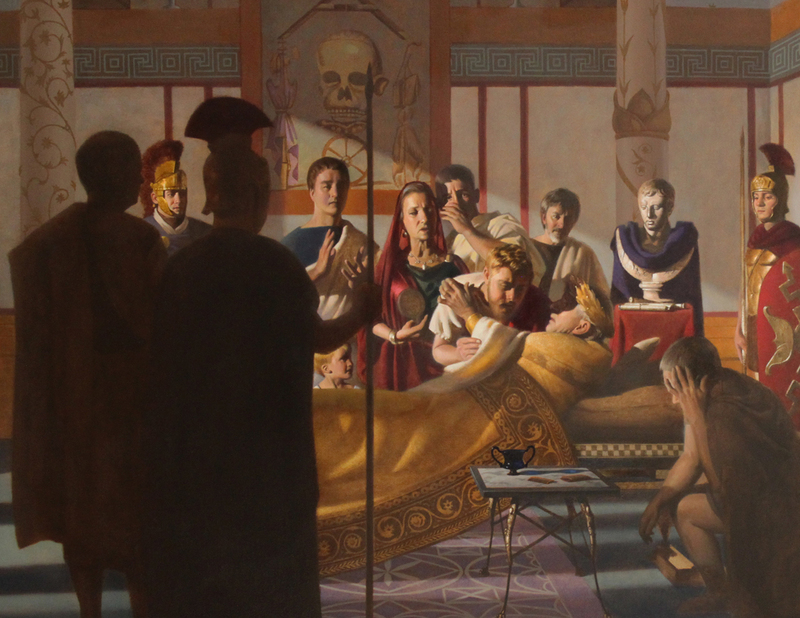 LCAD President Jonathan Burke (at right in photo), also graciously agreed to play the part of a Senator (seen just above Augustus in the painting). 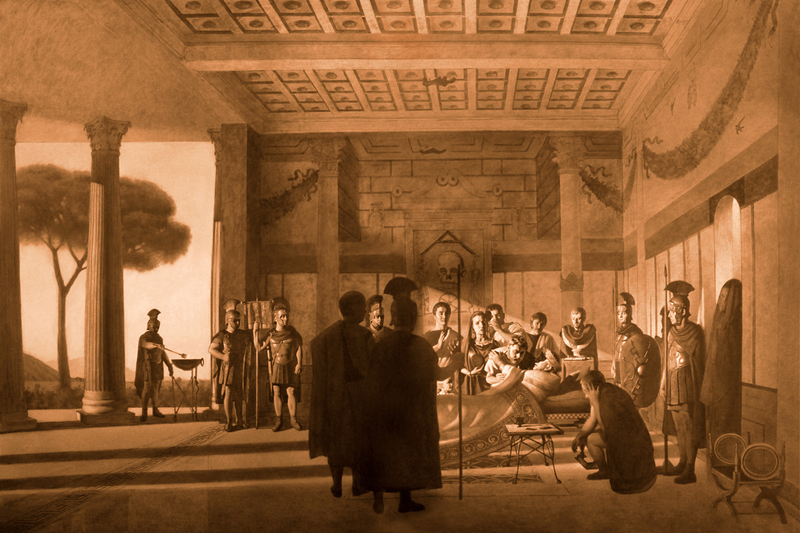 Between them, they posed as Tiberius, Livia, Senators, Roman guards, and even Death herself. This is Clayton Garrison. One day, I was sitting in my car getting ready to leave school for the day and desperately thinking how I would find the right person to pose for Augustus? At that very moment, I looked up and there was an older gentleman walking right in front of me, just the right age and the right look. I couldn’t believe it, he was perfect! Things were falling into place. Props, of course, are another important issue. Fortunately, the reenactors I met had many props that they brought along to the photo shoot. 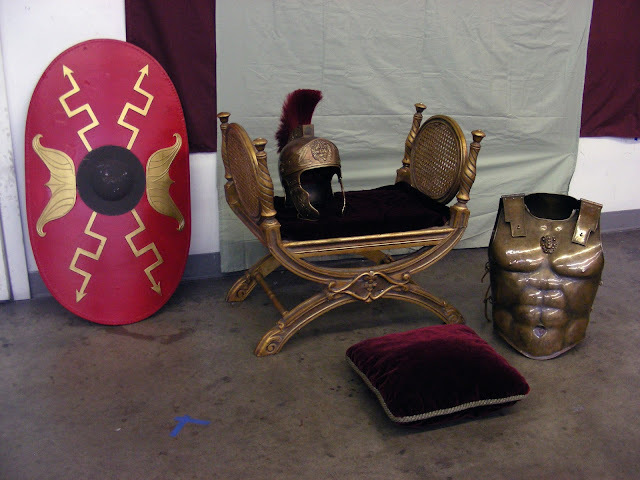 In addition to helmets, armour, and shields, they had an assortment of scrolls, cups, chairs, and many other things that would lend an air of authenticity. Not all the needs were met, however, and it was necessary to continue searching different sources. Museums are wonderful to visit and if you are able to find what you’re looking for, you can photograph an object from multiple angles. This at least helps give a sense of accurate color and structure. Another interesting coincidence was a conversation with my friend and fellow artist Erik Tiemens http://watersketch.com/#home. I was considering possibilities for the villa design and he suggested using a program called Sketchup http://www.sketchup.com/ (created by Google). After some practice, it was pretty easy to manage the shapes and create a unique piece of Roman architecture. One of the things I especially liked was using Google Earth http://www.google.com/earth/index.html to light the structure from Nola, Italy (where Augustus died), August 19th at 3pm, the precise time of death. It was particularly gratifying to know that this was the correct lighting. Once again, things were moving forward. This shows the stretching of the linen. 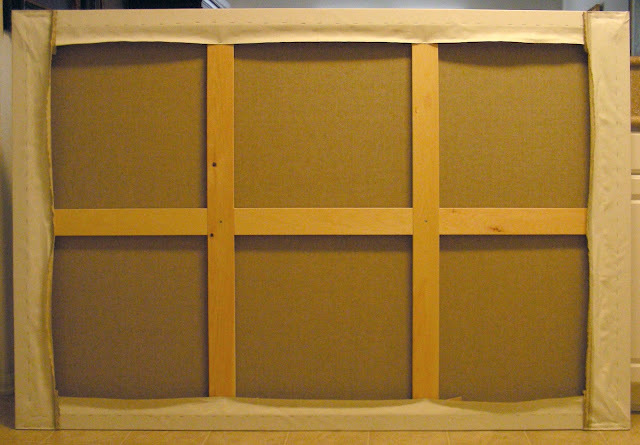 It is double oil primed portrait linen stretched over heavy duty Upper Canada stretcher bars. Cross supports and keys are necessary to keep the linen taut. 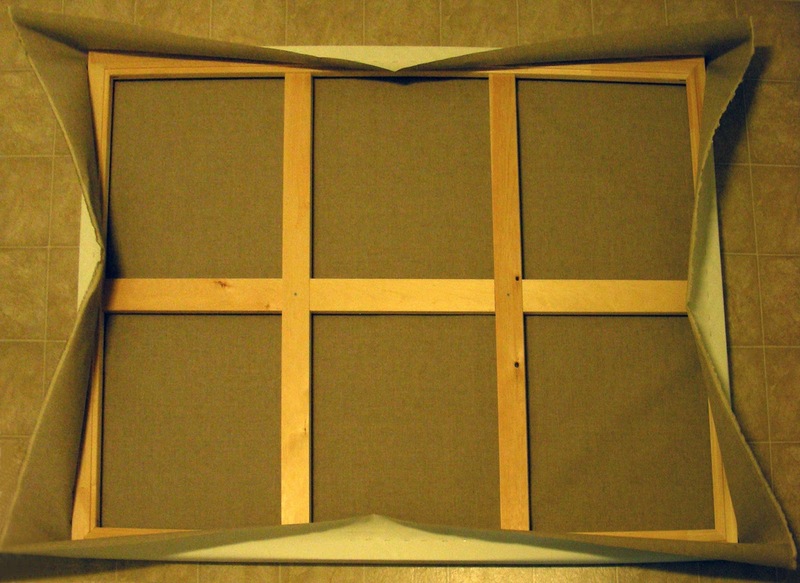 Here we see the finished canvas. Stretching linen is much more challenging than regular canvas. The weave is much tighter (and more durable), so there is little “give” when stapling it to the back of the stretchers. Once the keys are tapped in with a hammer, the linen tightens up. I’ve also left a fair amount of extra linen on the back. This is for the benefit of possible future restoration. Sometimes it is necessary to patch a damaged area of paint and having the same linen to recreate the pattern in the paint faithfully (by lightly pressing it) is helpful. It might also be useful in repairing a hole. Composition is likely the most vital part when considering a painting. The more complex the scene, the harder it becomes to balance the elements. Like Vermeer and Velasquez, I chose to use harmonic proportions. There are a multitude of formulas you can use to create harmony and here we see an armature of the rectangle. 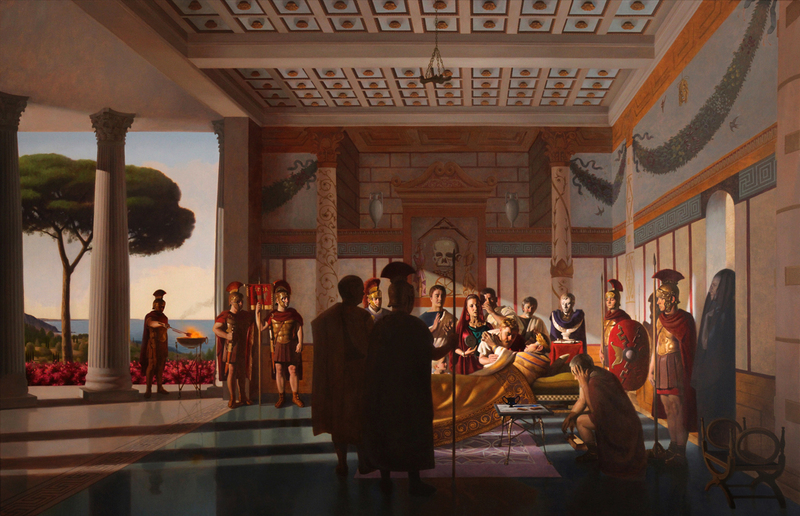 Augustus’ head is strategically placed at the 2/3 intersection, bringing the viewer’s eye to the primary focal point. These sections, based on 1/4, 1/3, and 1/2 intervals is a natural and pleasing placement for more important information. 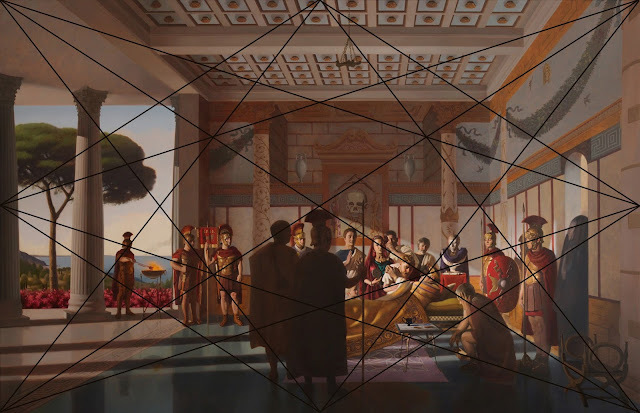 Notice how many figures are aligned with cross junctures and even angles of lines are followed to unify visual flow. An excellent resource I use for teaching Composition and Color is Classical Painting Atelier by Juliette Aristides. The approach I used for the underpainting is that of Anthony Van Dyke. He would block-in large dark shadow masses, leaving the white of the canvas to represent initial areas of light. By following this method, a solid value pattern becomes the chiaroscuro design. If these simple shapes “read” well, it will be much easier to follow through with the rendering of the light and half tone areas. Here is an overall view, continuing to add basic architectural shapes. 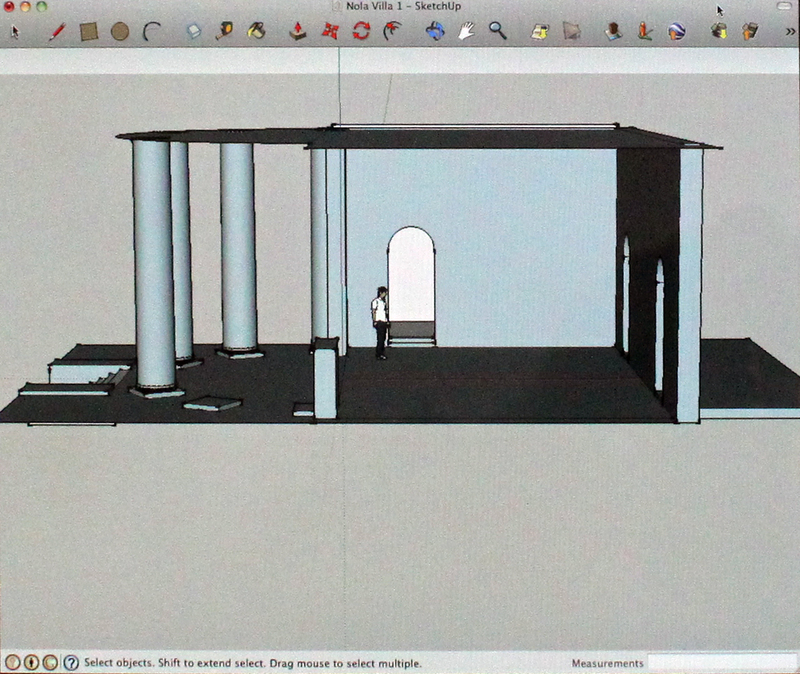 Details of the columns can now be seen, as well as further wall and ceiling decoration. 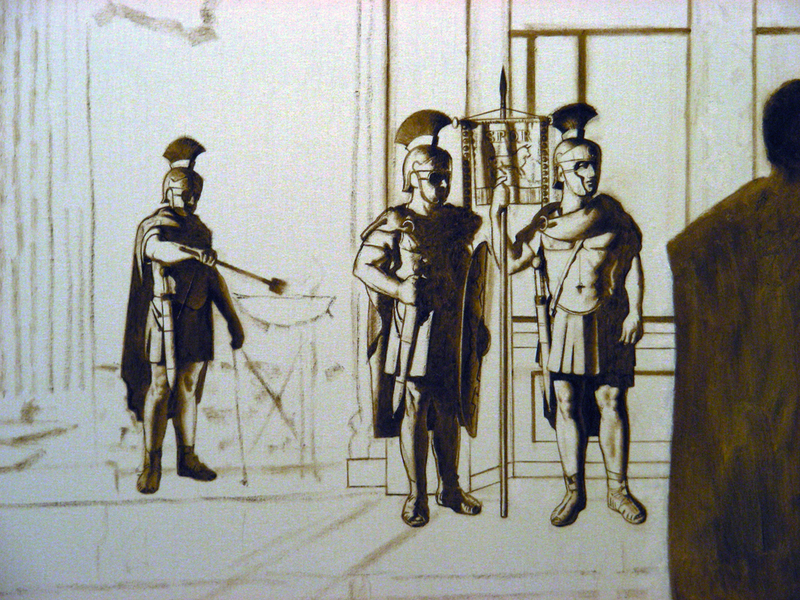 Detail of figures in rough block-in stage. 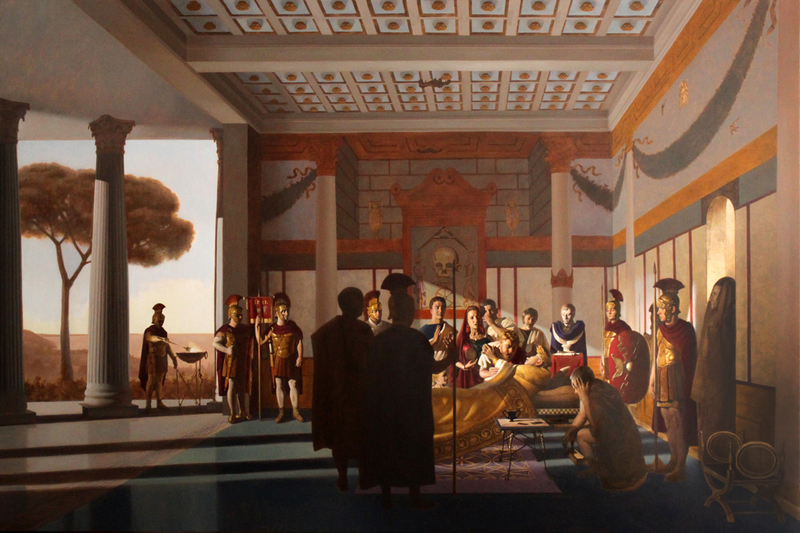 The standard held by the guard shows the letters “SPQR” which stands for “The Senate and People of Rome.” An image of the Sacred Bull is also referenced. The guard at the left is igniting a Turibulum, or incense burner, which is used to create sacred scents pleasing to the gods. Also, it symbolizes change from solid form into an ethereal form by consuming it with fire. 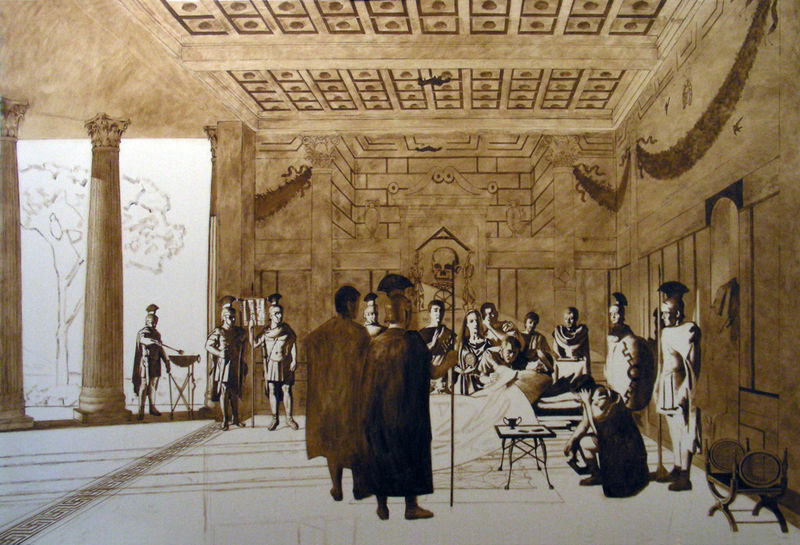 The next step is to work in sections, adding a thin layer or tone of Raw Umber over the dry contour of the background. Any modeling of light, such as on the columns, is simply wiped away with a rag. 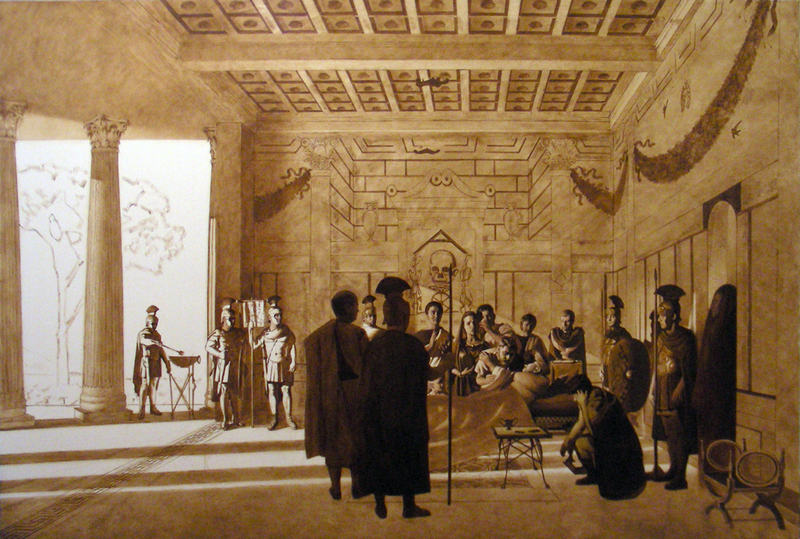 Subtleties of form are indicated through shadows (seen on wall to the left), then facial and drapery details are added. I am careful to continue working all around the painting, not getting bogged down in any particular area. Too much attention to finish early on can throw off the balance or “feel” of a work. It is better to work steadily, bringing up levels of interest while leaving some spaces subordinate. This gives the viewer’s eye a rest, not overwhelming them with information. Being sensitive and working at a slower pace requires patience, but if well handled can pay off in the end. Even considering textures that will contrast the overpainting later must be considered. For example, a rough bit of underpainting scrubbed in with a bristle brush might show through a translucent glaze of overpainting. The effect of light and shadow can be depicted in a very rich way, giving depth to an otherwise flat surface. This is the completed underpainting. Establishing underpainting values that are a bit lighter than the final overpainting values is recommended. If the values become too darkened, it can be difficult to lighten them again when color is added. Another crucial practice is to make sure that you are continually stepping back from a painting, getting a view from as much as 10-15 feet away. This should be done often. A painting should have an impact from across a large room. Strength of design, value, and color will command a viewer’s attention if proper care has been taken. Details of drawing may be enjoyed once the viewer’s interest has been piqued. Days are spent looking back and forth at the “feel” of the picture. It has a soft sense of air and space. None of the darkest darks are added yet. I decide that all of the major goals have been achieved. The composition holds together well. 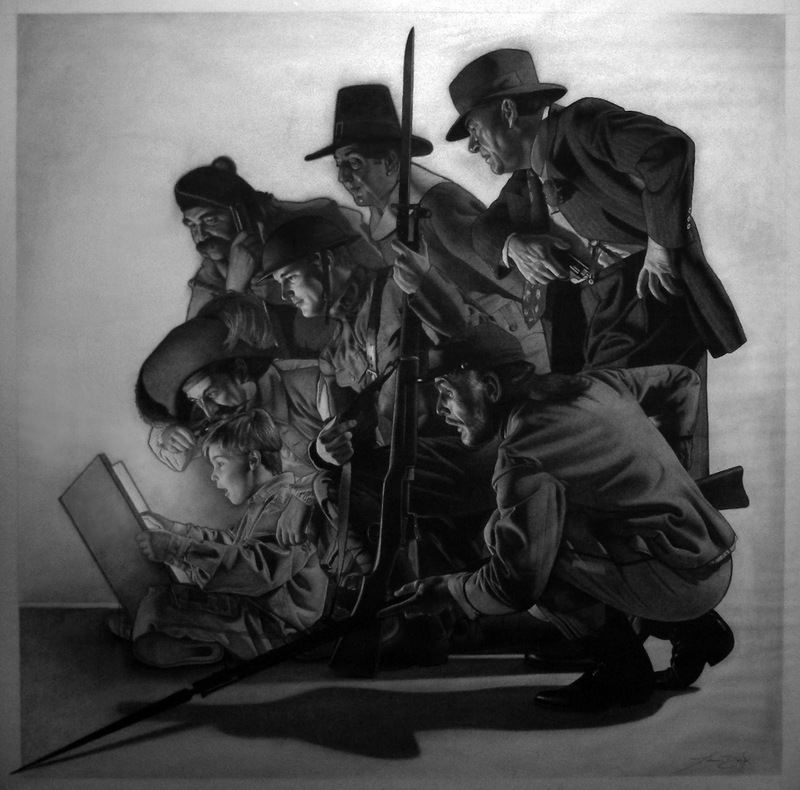 The light focuses on the main figures, allowing all other areas to be subordinate. 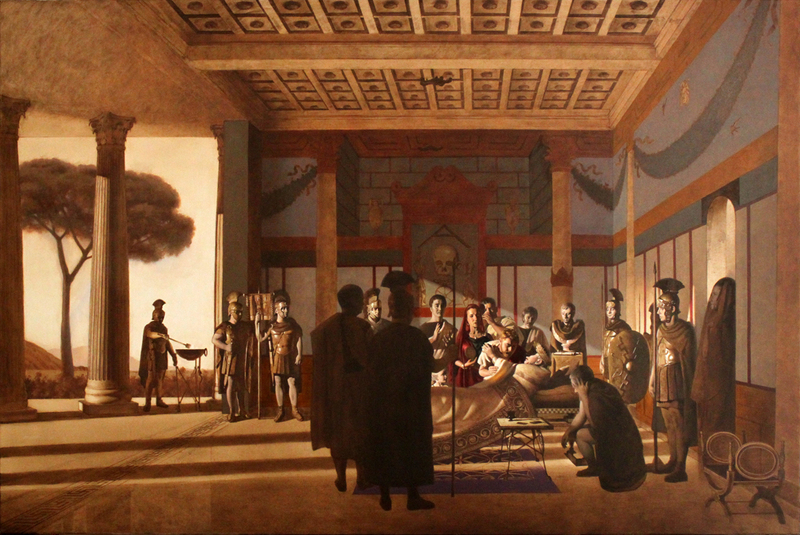 The dark foreground figures contrast or “stage” the light of the focal point and there are enough details to create a plausible historical scene. It is finally time to add color. Color is the easiest part of the painting process. Many students give color too much credit while short changing the more important factors like drawing, composition, value, and edges. While it is ultimately responsible for helping to express the mood of a picture, it is most effective when laid over a strong drawing and value structure. I begin the color phase much like the other parts. Keeping the larger relationships in mind, thinking broadly, will establish a proper overtone. This is achieved by glazing in thin layers of transparent and translucent pigments with the help of drying linseed oil. Warm and cool temperature shifts are arranged, with the idea of capturing the lively qualities of light. Also, look to the landscape at left. In the next slide, you will notice that the perspective has been changed. It made much more sense to put the villa higher on the hill side. Like today, everybody enjoys as much of a view as they can afford. Defining the large planes keeps order while observing warm light, cool shadows, and warm reflected light. This builds a convincing sense of perspective and atmosphere. If color temperatures do not rigorously follow the laws of light, a painting will almost certainly fail. Observing and understanding the effects of a given light source is an ongoing test of the artist’s abilities. The best example in recent memory is when I visited the Getty Center. Vermeer’s Woman in Blue Reading a Letter was on display. I looked at it for at least 20 minutes, overwhelmed by the intricate and subtle color/value transitions in this small work. He spoke volumes about the soft, cool light coming in the window, bathing everything it touched in perfect harmony. I mentioned earlier about the underpainting showing through a milky glaze of overpainting. This can especially be seen in the ceiling in the upper left corner and in the center moulding. The close value warm/cool relation vibrates the eye, creating more visual interest than a simple flat tone. Here is a detailed progression of the focal point. The soldiers’ uniforms, shields, and other clothing follow the color schemes of Roman apparel. Cloth was bright (and often gaudy), so I was careful to show that contrast. 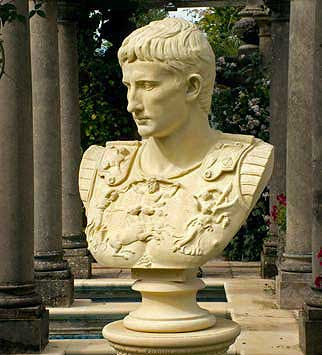 A purple hue, representing royalty, is added to the cape over the bust of Augustus. Flesh tones soften the palette. Added facial details heighten the sense of drama. There is a richness emerging as thin glazes are added to the darks. 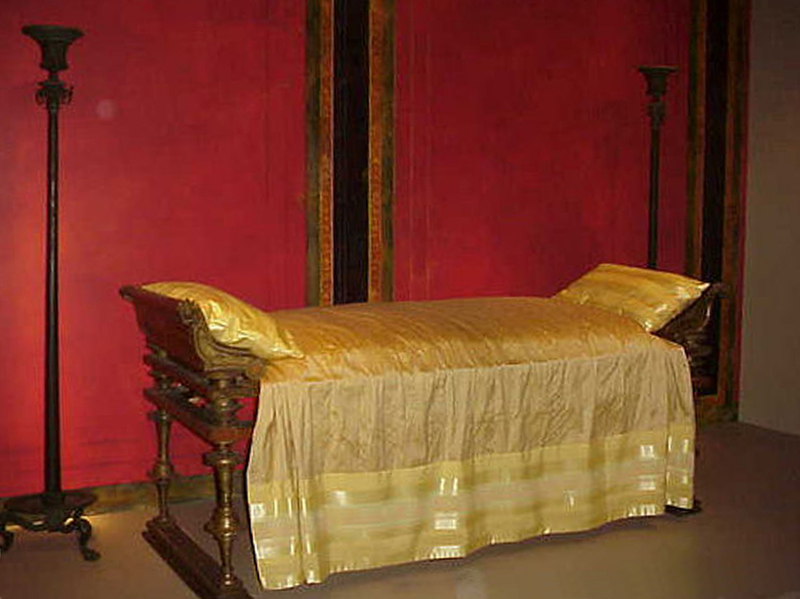 Livia’s cool crimson and viridian garments will contrast the warmer reds and ochres found in the guards’ uniforms. 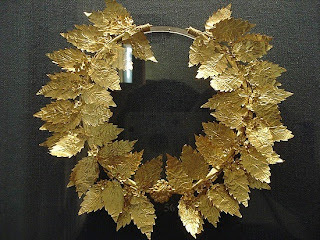 Visiting the Getty Villa was a tremendous help. 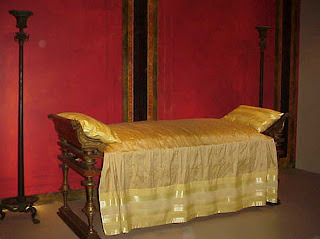 Since it is a 1st century AD replica of a Roman villa, several wall decorations were borrowed and utilized in the painting. The central mosaic, an Augustan era work is an allegory of the fleeting nature of earthly pleasures and of the leveling power of death. Below the skull, a butterfly and a wheel evoke the soul and its fate, while on the right and left, in a perfectly mirrored balance assured by the scale held up by the skull, are the figurative symbols of wealth (the sceptre and purple toga) and poverty (the beggar’s crook and knapsack).